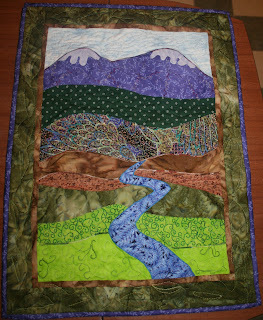 Sample quilt made this weekend for the upcoming landscape class that I'm teaching. Title made me laugh! I haven't done much on my blog lately and will have to nick this title if and when I have some of my own sewing to put on my blog. PS goes without saying that the landscape is great, good luck teaching your class.